J Clin Invest. 2007;117(3):512–512. https://doi.org/10.1172/JCI31235. Philip Ball. Farrar, Straus and Giroux. New York, New York, USA. 2006. $27.00ISBN: 0-374-22979-1 (hardcover).448 pp. Contentious, cantankerous, and sometimes self contradictory, the peripatetic Theophrastus Bombastus von Hohenheim, better known as Paracelsus, was arguably the prototype of the physician-scientist. Born in a Swiss hamlet in 1493, his brief life spanned a period of seismic change in religion, politics, and science. Like an ex-president or celebrity chef, this medieval magus was known to and by a laundry list of the rich and famous. 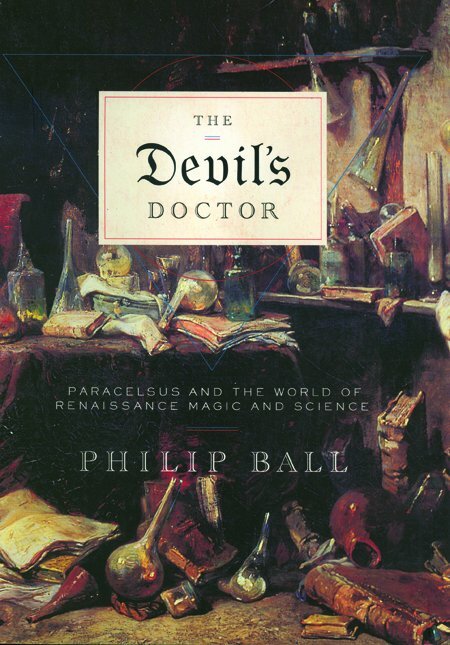 Phillip Ball, a prize-winning author on scientific matters, has attempted to capture the breath and essence of this man and his times in The devil’s doctor: Paracelsus and the world of Renaissance magic and science. The fascination Ball stirs in his account of the life of Paracelsus stems not from the fact that his subject treated German humanist Erasmus or consorted with Swiss theologian Zwingli, but rather that he mediated the transition between alchemy and chemistry and between astrology and astronomy at a time when barbers, apothecaries, and priests were gradually ceding ground to scientists, surgeons, and physicians. Like Robert Boyle, William Harvey, and Francis Bacon, all notable figures from this important time of transition, Paracelsus simultaneously retained and disrupted distinct elements of old beliefs. Paracelsus gained his training in the traditional way, first, through apprenticeship to his physician father, then as an “intellectual vagabond,” moving between the universities of medieval Germany. His assumed name, meaning “beyond Celsus,” referred to the Roman scientist and author of De re medicina. During his time, medicine and science, just like religion, were based on the fundamentals of received truth. The ancient texts of Aristotle, Galen, and Ptolemy were memorized as literal guides to contemporary medicine and science and their subjugation to the stars. While numerology, uroscopy, and astrology may seem like amusing echoes of our discarded past, these disciplines had a certain logic that underpinned a thriving economic endeavor. Paracelsus the alchemist challenged this established order by founding his medical practice on observation, examination, and experimentation. He never doubted God’s role in creation, but, as we are reminded by Ball, believed that this creation could be explored and understood independent of God himself. The so-called “princes of established medicine” — the local doyens of the medical faculty — had much to lose from this disruptive character. Paracelsus hated their fine clothes, their lofty pronunciations of received truth, and their “friendly, affectionate manner, ceremony [and] ingratiating ways,” masquerading as substitutes for effective patient treatment. He despised their lack of investigation and experimentation and their avoidance of physical contact with their patients, areas consigned largely to the barber/surgeons. As the book details, his confrontational style led to expulsions, periodic penury, and a life on the move, from Ancona to Algiers, Cairo to Cordoba, Moscow to Modena. He was castigated and despised, ridiculed as an inebriate, and as feared as the sinister Doctor Faustus. But he was noticed. Indeed, Paracelsus did not so much make a lasting scientific discovery as challenge a belief system. Indeed, he was often wrong, but in the words of Ball, he was “wrong and reasonable,” and people listened. The reason we remember him and not others is probably the medium of his message: confrontational and explicit dispute promulgated in person widely and sometimes wildly and accompanied by a prolific output of written material, even though much of it was published after he perished. His writings included treatises on the details of alchemy, what may have been the first textbook on biochemistry, sympathetic analyses of mental illness, a clinical description of syphilis, and his Astronomia magna — his hitchhiker’s guide to life, the universe, and everything. His intense travel schedule and efforts to promote his views, seek financial and political support, and engage his critics presaged the contemporary physician-scientist and were maintained until his death in Salzburg in 1541. Ball has done a remarkable job in pulling together the scraps of facts and myths that relate to the life of this contradictory character. Irritating and inspired, lucid and ludicrous, Paracelsus combined fantastical theories of the regenerative powers of putrefaction and sperm with a subtle appreciation of dose-response curves in segregating therapeutic efficacy from the adverse effects of mercury. It’s all there, and more. However, this is not the spare, addictive masterpiece that is the biography of that other misanthropic celibate, Isaac Newton (1), nor does it have the descriptive flair of the political, religious, and intellectual climates of the time as found in novels such as An instance of the fingerpost (2) or Havoc, in its third year (3). Geick, J. 2004.Isaac Newton. Vintage. London, United Kingdom. 288 pp. Pears, I. 2000.An instance of the fingerpost. Riverhead Trade. Oxford, United Kingdom. 704 pp. Bennett, R. 2004.Havoc, in its third year. Simon & Schuster. New York, New York, USA. 256 pp.